It was only a matter of time before cell phone companies came out with devices comparable to iPods in functionality. 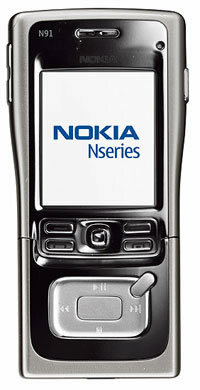 Today is that day as Nokia announced its N91, a phone with a 4-GB hard drive. Although the device will be priced between $500-$900 it gives you a phone and a music player in a form-factor about the size of a an iPod Mini. What remains to be seen is which carriers will want such a device. Carriers are looking for ways to generate revenue from music and such a player could conceivable allow users to download songs without making use of wireless networks. The holy grail for cellular companies is to get people to pay to download music, radio and TV. A device like the N91 may sidestep what these companies see as a lucrative business model. Will The Nokia N91 Become an iPod Killer? Moreover, Apple iTunes service is slick and the songs from the service won’t work on the Nokia device. Still, there are an abundance of ways people can download music these days so the lack of iTunes support may not hamper the Nokia phone which the company hopes to sell 40 million of in the first year. Analysts think at the price of $500 or 2.5 times what an iPOD Mini costs, this target is over-ambitious. In the end there is a coolness factor to the iPod which doesn’t exist with Nokia as of yet. Even the device name, N91, lacks coolness. Steve Jobs deserves a great deal of credit for naming products, amazing design and marketing. Will people want to pay hundreds more for a music player that has a phone and tell people it is called N91? I think the name limits the appeal but if enough service providers get behind this new device it could really revolutionize the cellular market. It was only a matter of time before cell phone companies came out with devices comparable to iPods in functionality. Today is that day as Nokia announced its N91, a phone with a 4-GB hard drive. Although the device will be priced between \$500-\$900 it gives you a phone and a music player in a form-factor about the size of a an iPod Mini. Moreover, Apple iTunes service is slick and the songs from the service won’t work on the Nokia device. Still, there are an abundance of ways people can download music these days so the lack of iTunes support may not hamper the Nokia phone which the company hopes to sell 40 million of in the first year. Analysts think at the price of \$500 or 2.5 times what an iPOD Mini costs, this target is over-ambitious.